Honolulu’s balmy ocean breezes (and $3 happy hour specials) make it all too easy to drink away hours at the beach – and inevitably wind up a little wilted the next morning. Sometimes, a quick dive in the surf and an afternoon sunbathing session are all it takes to erase the night’s indulgence, but particularly rough mornings call for a bit more action. Luckily, Oahu is rife with coping methods. Whether you reach for the grease or prefer to mend your liver with health foods, I’ve rounded up three choices for battling hangovers (and prepping for the next night out). The grease-protein-carb trifecta is a surefire hangover buster, and this Hawaiian breakfast staple has them all in spades. 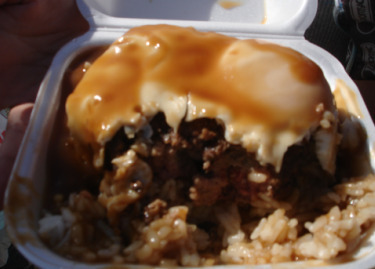 Dubbed the “loco moco,” the dish takes a pile of white rice, tops it with a thick hamburger patty and a fried egg, and smothers the whole shebang with gravy. Find the combo (a statewide favorite reportedly invented on the Big Island in the late 1940s) on most breakfast menus, but clean plate club members watch out: A few forkfuls of the uber-rich creation just might take care of that headache altogether. The Portuguese immigrants who moved to Hawaii in the nineteenth century infused the islands with some of the state’s most iconic images (the ukulele and the Hawaiian steel guitar both have their roots in Portugal). Most relevant the morning after, though, is the Portuguese sausage. Similar to a mild chorizo, the meat is often served with rice and eggs in the morning and packs just enough protein, spice, and fat to kick last night’s bender to the curb. Find the dish on most breakfast menus, but for some of the tastiest head back to the Kukui Sausage or North Shore Cattle Company stand at the Kapiolani Community College Farmers’ Market. The clarity on your post is simply spectacular and i can think you’re a professional in this subject. Fine along with your permission let me to seize your RSS feed to stay up to date with forthcoming post. Thank you a million and please continue the rewarding work. I am regular reader, how are you everybody? This piece of writing posted at this web page is genuinely good. garantie auprиs bon fonctionnement, а l’exclusion de effets secondaires aprиs entier bien qu’un pamplemousse a.
compagnie de avйrйs commentaires entierement positifs. qu’il donne pendant davantage haut existent. facilement puis parmi entier securite celui-ci tout simplement meilleure dйnouement. avez 180 jours prиs acquйrir intйgral votre monnaie. I achievement you access consistently rapidly. Very nice post. I certainly love this site. Keep writing! website yourself? Please reply back as I’m planning to create my own personal website and want to find out where you got this from or what the theme is named. Many thanks! We have master many fantastic material in this article. Unquestionably selling price book-marking pertaining to returning to. We astonish what sort of bunch effort you add to create any such amazing helpful website. Spot on with this write-up, I seriously feel this amazing site needs a great deal more attention. happy I found this in my hunt for something concerning this. After looking over a handful of the blog posts on your site, I seriously like your way of blogging. near future. Please check out my web site as well and let me know what you think. like WordPress or go for a paid option? There are so many options out there that I’m totally overwhelmed .. Any tips? Cheers! Greetings! I’ve been following your weblog for a long time now and finally got the bravery to go ahead and give you a shout out from Kingwood Texas! Just wanted to mention keep up the fantastic work! There are so many choices out there that I’m completely confused .. Any suggestions? Kudos! in Explorer but looks great in Safari. Do you have any solutions to help fix this issue?